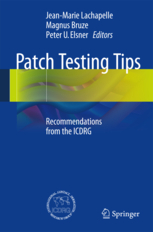 This book is a compendium of tips on many different aspects of patch testing based on the recommendations of the International Contact Dermatitis Research Group (ICDRG), which is the reference group for all dermato-allergologists. It is intended to complement the book Patch Testing and Prick Testing: A Practical Guide by J.-M. Lachapelle and H. Maibach, which is an official publication of the ICDRG now in its third edition. Among the wide variety of topics covered are pitfalls, legal aspects, patch testing with ultrasonic bath extracts, the role of patch testing in occupational contact dermatitis and atopic dermatitis, semi-open tests, the implications of a negative test, patch testing validity, selection of extra allergens and patch testing in the tropics. Many illustrations are included and all information is completely up-to-date. This book will be of value to all practicing dermatologists.